The day I’ve been patiently waiting for has finally arrived! The lilac bushes are blooming and that means I can bring these delicate beauties indoors to fill our living space with their sweet fragrance. 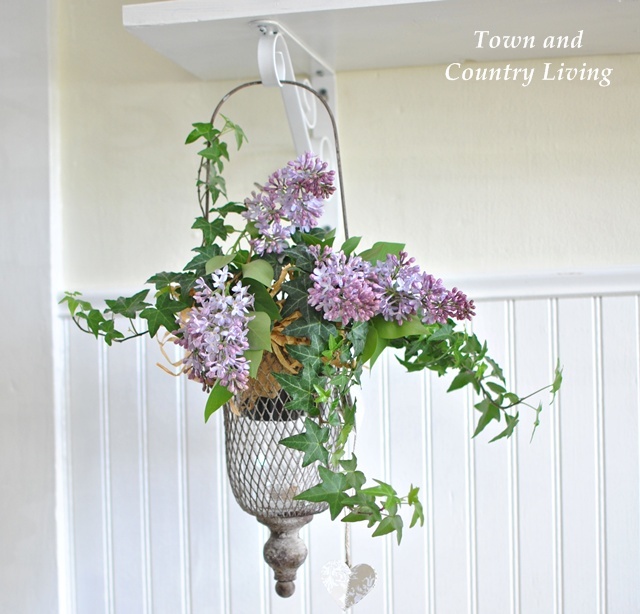 Decorating with lilacs is so easy to do because they are perhaps the easiest of flowers to arrange. Lilacs naturally spill over in a large enamelware pot. I didn’t even arrange this grouping of lilacs. I took an enamel pot of water outside with me and tucked the lilac branches into the pot as I pruned them off their bush. When I dragged the pot inside and set it on the cupboard, I realized they looked good as is. One thing led to another and I got a little carried away and started decorating with lilacs in full force. 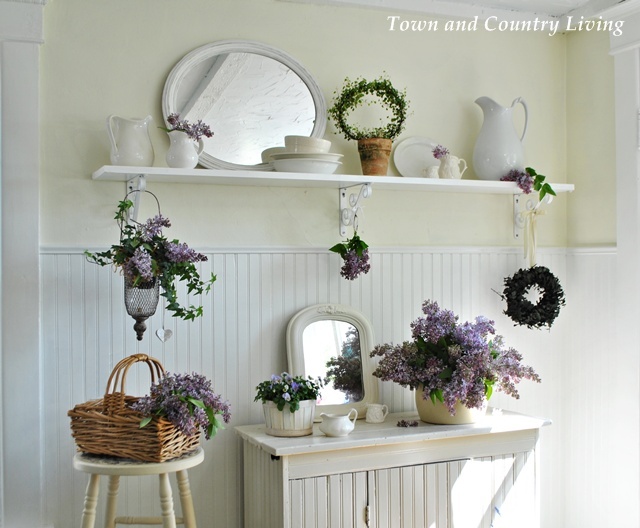 The new shelving in the kitchen seemed like a good place to start decorating with lilacs. 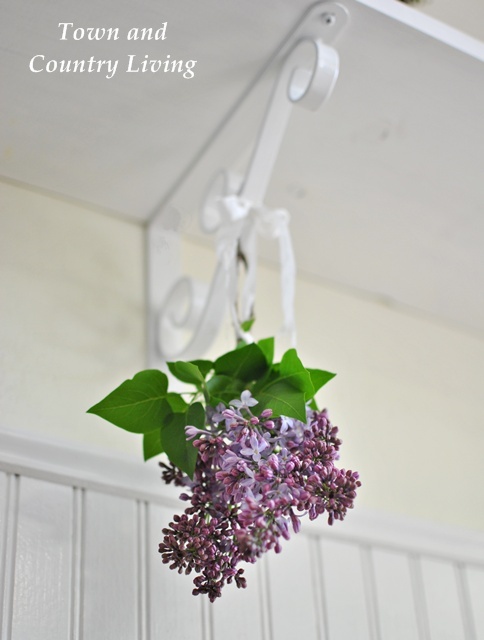 I hung a small batch of lilacs to the shelf bracket using a length of crinkled seam binding. 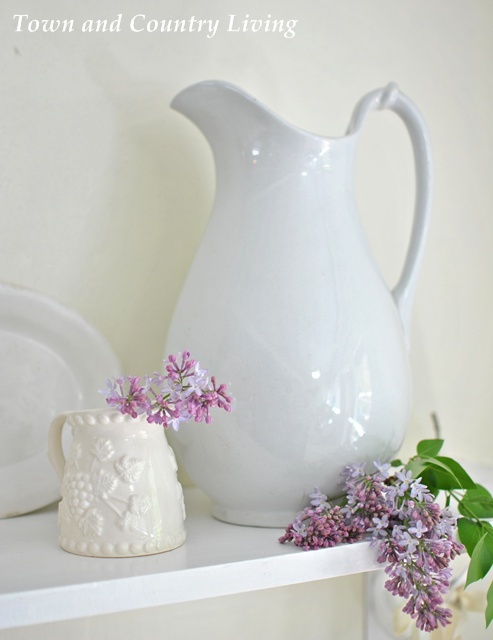 Another small sprig of lilacs is tucked into a small white ironstone pitcher. 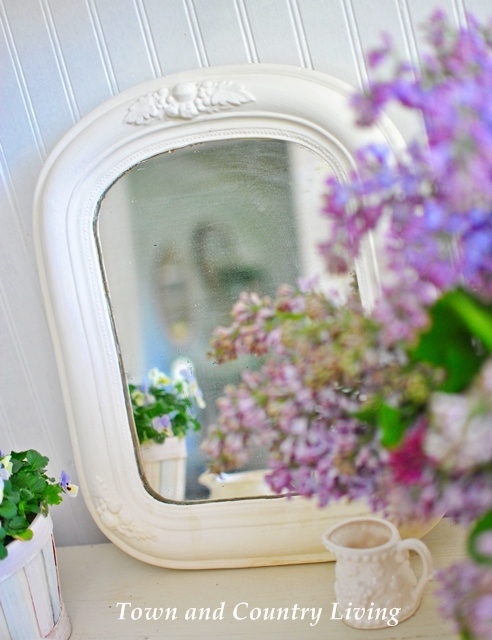 Of course, I had to include my newest flea market find in my vignette of decorating with lilacs. I decided the hanging ivy would look good with a few sprigs of lilacs. 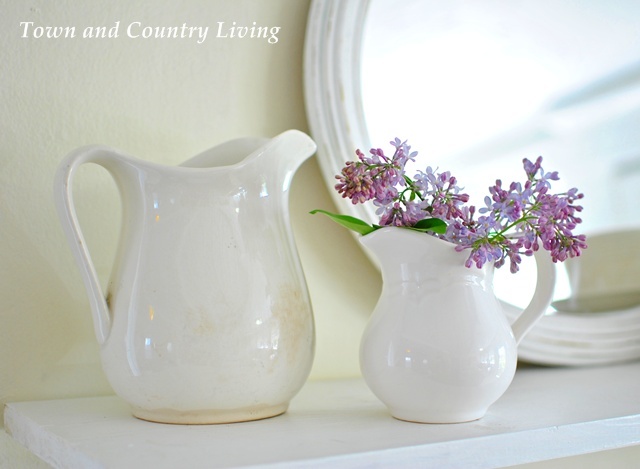 To keep the lilacs fresh, simply tuck them in single bud vases filled with water. 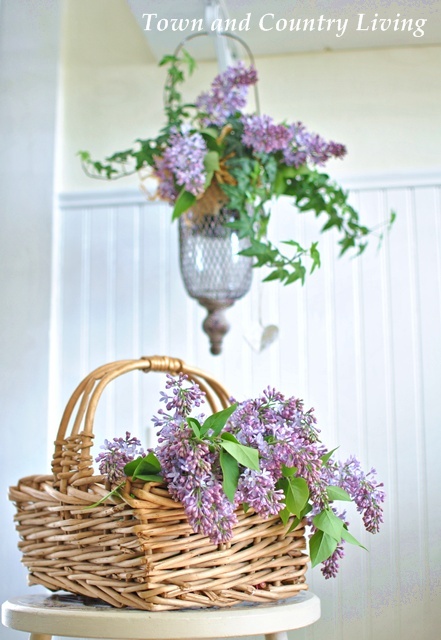 Lilacs tucked in a basket for easy carrying look good as is. I cut flowers with about half the buds unopened so they’d last longer indoors. 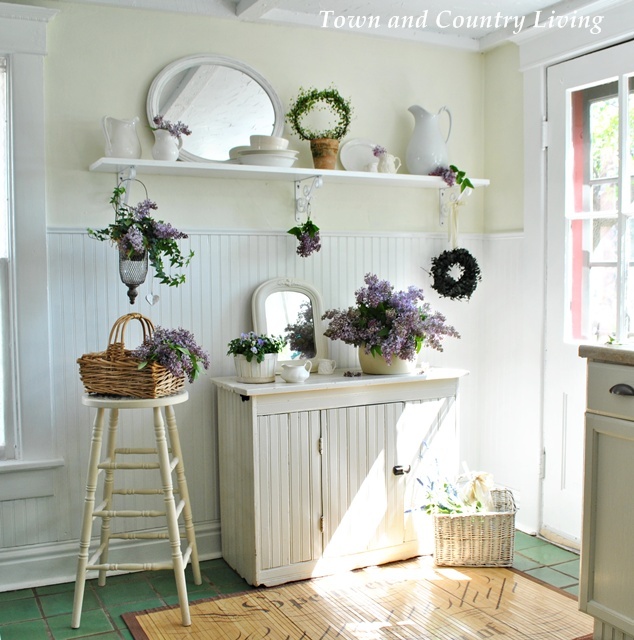 Decorating with lilacs in a white kitchen really makes them pop and take center stage. A basket of violets adds another shade of lavender to the grouping of lilacs. Whenever there’s a gaping hole in a vignette, I tend to fill it with a vintage mirror. 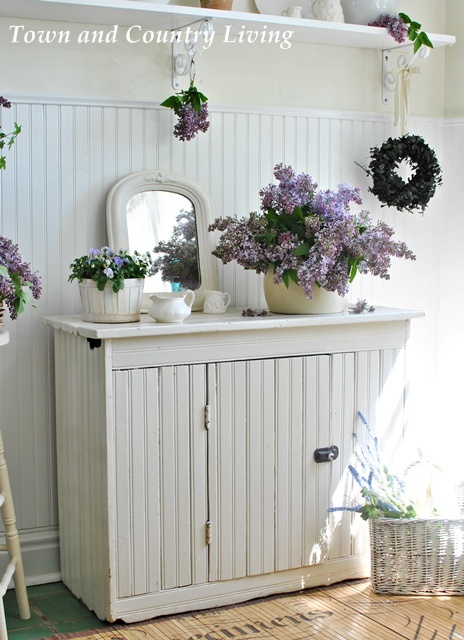 Decorating with lilacs gives me great pleasure! I love the fragrance and was so happy to see the bushes in bloom. 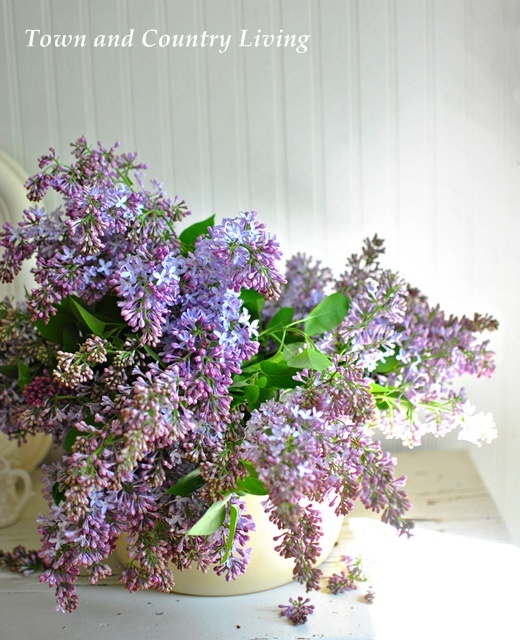 Do you have lilacs in your garden and if you do, have you brought them inside yet? you can never have too many lilacs!! love all the pretty shades! We haven’t seen your new shelving yet…..looks quite nice!!! 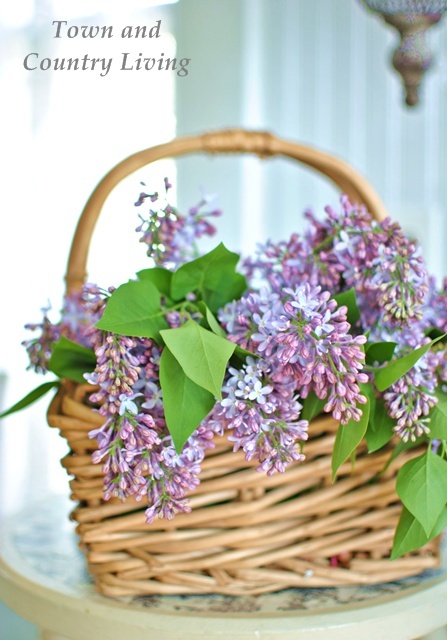 My lilacs finally opened also and brought a huge bunch inside, smells heavenly……..here’s a tip…..smash the lower stems with a hammer before putting in water, they’ll last longer. 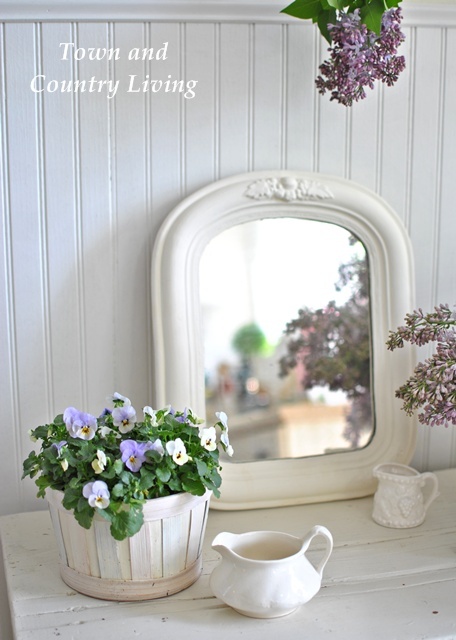 A very pretty lilac vignette! Love the beautiful sunlight streaming in through your kitchen, Jennifer! and yes i have brought them inside, my livingroom and bedroom now have the sweet lilac smell !! OK, we must be thinking alike. I did pics of my lilacs this weekend and have a post ready also. They are heavenly, the aroma fills the whole house. Beautiful! I love lilacs so much! Your lilacs are so pretty, Jennifer. 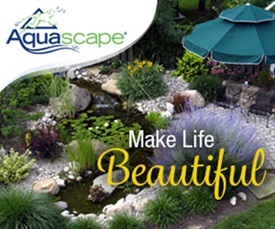 You have some great ideas for decorating with them. We do have a lilac bush but I haven’t cut any to bring inside yet . . . after seeing your post, I’m pretty sure that’s what I’ll be doing this morning! Oh, you lucky girl, Jennifer! I love the smell of lilacs and their pretty color. I have no room here to plant one. I either have to talk my daughter into planting one or make a friend with lilacs! I’d love to have some of those blooms in my house perfuming the air with that great scent. Your lilac vignette is gorgeous. I have to run outside and see if my lilacs have bloomed yet. I haven’t checked on them in a few days, so I hope I didn’t miss them! Oh Jen I bet your kitchen smells so good. I just love lilacs. Mine are just starting to bloom. I love how sweet and pretty this vignette is. I bet you love to walk by and see how sweet that is. Beautiful. So pretty! I especially love them with the ivy. Love Lilacs, there grace and fragrance!! Beautiful vignettes. Beautiful, Jen! This makes me wish I had planted lilacs years ago! I don’t really know lilacs very well but they are so pretty and I just love your photography. so fresh and bright. 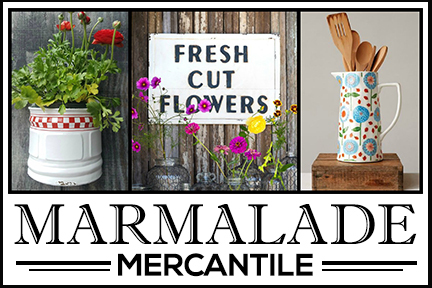 Yours on that new shelving is just so darn pretty and I’ll bet the scent is wafting everywhere….lilacs have the most wonderful scent! I love the look and fragrance of lilacs. There is a pitiful little plant in my yard that I have been nursing for several years. I hope it takes off and does something before long, but it may never do much as lilacs do not seem to thrive here. Your lilacs are beautiful in their containers. Oh how I love those lilacs. They are so pretty. I can see that you are having fun with these lilacs. I do too! I never tire of looking at your beautiful white kitchen. The lilacs are perfect and your photos are absolutely professional! Wonderful job showcasing your lilacs. I’ll be sharing it on my Facebook page tonight. 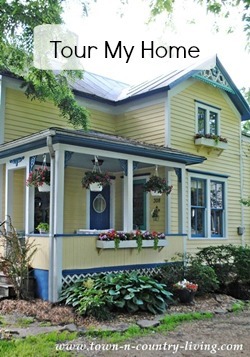 your staging is so lovely, jennifer–and the smell must be heavenly! have a great weekend! 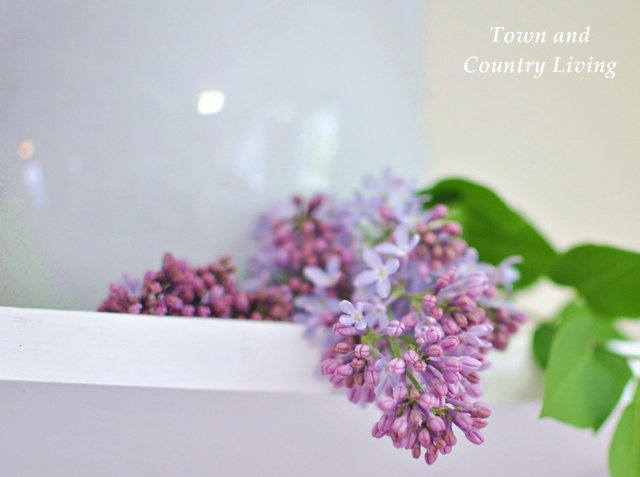 Our homes never smell better than when filled with our lilacs. 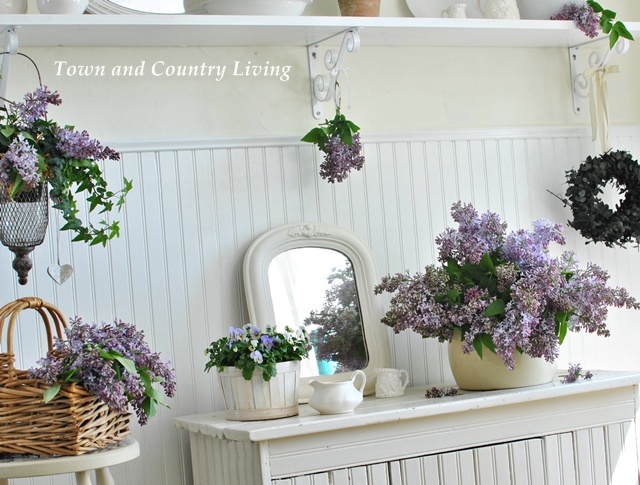 Beautiful lilacs and love them in your kitchen!! I don’t think ours are planning to bloom this year… been waiting and nothing yet. 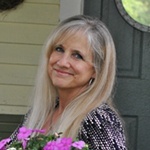 Thanks for sharing at Feathered Nest Friday! 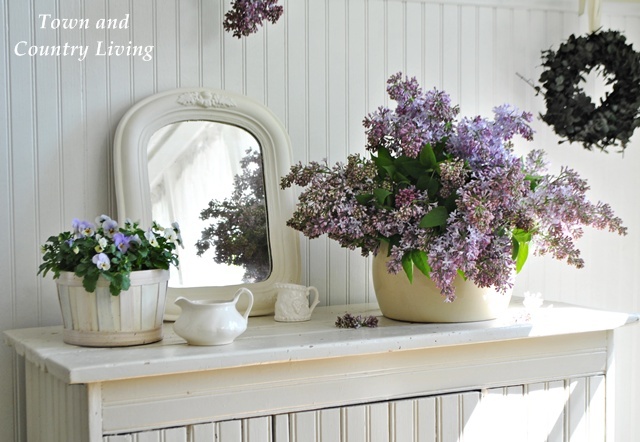 I’m a big fan of fresh flowers in the house and these lilacs would smell amazing. I love how you have grouped them together too. It is all just lovely Jennifer. Thank you for sharing them at Shabbilicious Friday. I will be featuring this post at tomorrow’s party. Just scrolling thru this post from last May….oh, how I wish for spring!!! I love lilacs and can’t wait to enjoy them in my yard and house once again. Beautiful post to look back on, on this cold winter day in the Northeast! Thank you!